How long is too long when it comes to loud noises? Loud noises can drastically affect your hearing. More than one in every three Australians has sustained hearing loss from excessive noise. Every day we’re exposed to noise, whether it’s from the TV or radio, traffic in the street or noisy shopping centres. 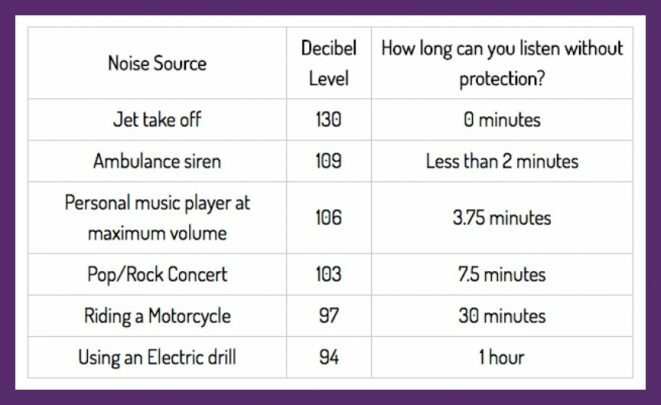 While most of these noise levels are safe, prolonged exposure at a high decibel can damage the inner ear and cause permanent hearing loss. But there are some simple precautions you can take to reduce your chances of hearing loss. What’s a safe noise level? Permanent hearing loss occurs when the inner ear is damaged by loud noise or wear and tear on the hairs or nerve cells of the cochlea. The cochlea sends sound signals to the brain and when its hairs or nerves are damaged, electrical signals aren’t transmitted the same way, causing hearing loss. This damage can be done to your inner ear without the noises having been loud enough to cause you physical pain. Long periods of listening to loud music or being surrounded by machinery can cause hearing loss, just as can short bursts of loud sound. So, how loud is too loud? As a rule of thumb, noise is loud enough to be bad for your inner ear when you must raise your voice to be heard over the top of it. Many of the common activities we are exposed to everyday are loud enough to cause irreversible damage within a matter of minutes, as these guidelines set out by Australian Hearing show. How can I tell my hearing’s damaged? Struggling to hear people when they’re speaking to you in a loud place, or high-pitched tones sounding muffled, are common signs of hearing loss. Many people also find themselves increasing the volume on the radio or television to a point where other people complain it’s too loud – another sign your hearing may be damaged. Talking on the phone can also become difficult and some people find themselves relaying on lip reading to catch words they can’t hear. What are the other big hearing-loss risks? What are the best ways to preserve my hearing? Have you noticed your hearing changing over the years? Do you avoid loud noises?